Oct. 24, 2016: Tom Stoppard and Carey Perloff at A.C.T. Tom Stoppard & Carey Perloff, in conversation at A.C.T.’s Geary Theater. Excerpts from their conversation. Tom Stoppard’s latest play, The Hard Problem, is now at the Geary. On October 3, 2016, on stage at that theater, ACT Artistic Director Carey Perloff spoke with Stoppard about his career, his ideas about playwrighting, and his new play. On stage with them was neuroscientist Linda Wilbrecht. 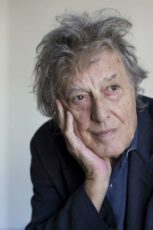 Tom Stoppard is the author of several plays, including Arcadia, The Coast of Utopia, Rosencrantz and Gildenstern are Dead, and The Real Thing. The Hard Problem deals with the relationship of consciousness, thought and morality, the non-physical aspect of being human, with the physical aspect, the brain. In the discussion, Stoppard talks about his preoccupation with the subject and what words like “good” actually mean. Excerpted and edited by Arts-Waves host Richard Wolinsky; special thanks to Kevin Kopjak and Christine Miller.